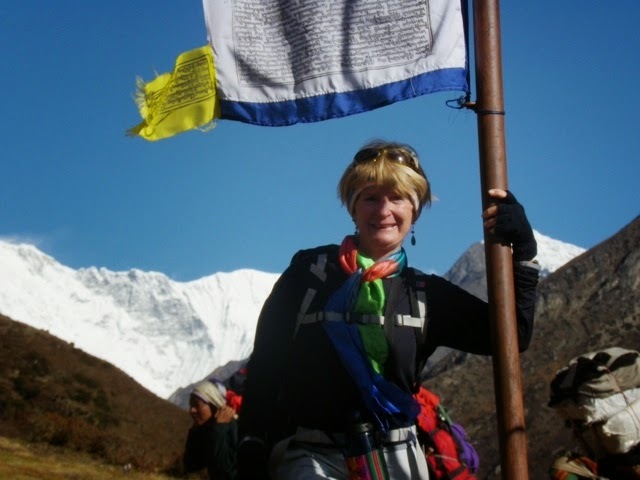 When Lyn takes groups of women to Nepal, they embark on a particularly special journey. She partners with them on tailored treks to not only to experience new sights and cultures, but to push the boundaries of their everyday, and lead them on a personal adventure. Ferocious winds begin roaring down from the mountain tops from mid-morning, and continue until early evening in Marpha, situated in the Annapurna region of Nepal. A harsh climate, and remote location have for many years limited access to this hidden gem. Today Marpha is within easy reach to any visitor and this incredible landscape can be accessed either by foot, or by vehicle from Pokhara. As you navigate your way through stone paved walkways, gullies, stoned-layered flat roofed houses which are boarded by stacks of split wood you are welcomed in to rest in local hotels and restaurants run by local families. It is almost impossible to miss the famous Marpha apple pie and brandy which the region is renowned for. The journey is full of pleasant surprises, you can wander through the many souvenir shops, looking for a fossil dug up from the Kali Gandaki Valley, or if you know where to look you may find yourself lost for words at the beauty of the Rupse Waterfall! Lyn reflects on how during their smooth ride on a high, but flat land with a cool breeze, and stunning view of the Himalaya, they all had an overwhelming sense of being “thrown out in the wilderness” As they climbed to elevation the famous gush of the Marpha’s apple trees welcomed them into the warmth of the locals who treat you like family. Some may even allow you to visit their farms and eat as many apples as you like, straight from the tree! On top of the current bliss and enjoyment an exciting development is taking place in Marpha that will be completed by June 2015. A new 35km route is being developed to allow for an alternative trekking experience through the Annapurna Circuit. This will allow for more variety in the trekkers experience. On her first visit to Nepal 20 years ago, Lyn remembers trying to find my way back to my hotel situated in Balaju. Knowing only enough to navigate her way through the maize of vendors, vehicles, and people shoving into vehicles. She describes it like walking through a herd of elephants on wheels - except the elephants would pay more attention and belch less smoke. Back then not many spoke English, and if they did, it was the lyrics to Bob Marley songs. Only today is it starting to become a common tongue, still there are no signs telling you where to stand or which vehicle to catch. The route is on the buses in Nepali, so Lyn’s best advice is to learn the language, although having a guide such a Lyn who today can speak the language is a great help as they do have a cultural code and she is well accustomed to getting the best information and deals. Travelling with Lyn also ensures that you don’t miss out on the gems that Kathmandu’s alleyways conceal. Every day thousands of visitors, expats and Nepali’s alike walk on by oblivious to what lies beyond a special doorway… unmarked and low, it seems to go into someone’s home, but further down another doorway, and then another, you will catch occasional glimpses of murky passageways and dusty inner courtyards. With Lyn you can take a peek and plunge into the hidden world of mystery that most travellers do not dare to explore... after all who would walk in to what seems someone’s backyard without an invitation. But therein lies a world that is both private and public, each courtyard holding its own history and story, some that go back well into the 15th century. Another thing you will notice in your travels through Kathmandu and the surrounding areas are the colours! Colours everywhere as you wander along any street in Thamel. You will probably see several shops selling felted crafts and goods all made locally. Felt fabric is made by matting moistened wool under pressure and heat. The dyed wool which is imported from New Zealand, is saturated in hot water, and kneaded by hand. After being sufficiently worked, it is rinsed and flattened, before being laid to dry. The end product is felt. The felt can be cut and sewn like other fabric into array of products ranging from bags, purses, hats, puppets, soft toys, decorative hangers and even shoes! These are exported to many countries all over the world. With Nepali men searching for job opportunities abroad, the women too then have to find daily work to support their families while their husbands are away. Felt making, is a job that women of Nepal, who often lack a formal education, can perform with ease. Most felt factories in Nepal hire women, who create with love and passion and use this space to connect with other women in their community. Lyn says “during my 20 years of traveling throughout Nepal I have experienced may changes, not only in Kathmandu or the mountains, but also in the villages I have visited”. Today her passion has grown from exploring to also support village communities in Maguwa . She says, “is to not only help to increase the standard of education in remote areas, but also to improve the infrastructure of the schools”. Lyn is now working on her third school project with the assistance of children from a Sydney based Public School, who organise fundraisers. During their 5 years together they have renovated a school building, provided the children with an amenities block, water, desks, lockers, and much need equipment. Today they are working on building a block of 4 classrooms at a local high school. The journey to this remote area village of Maguwa is not for the faint hearted, it is a long, challenging 9 hour journey by land cruiser or local bus from Kathmandu. A land cruiser is used when Lyn travels with her group to a 4 day home stay visit to the village, on the return journey they hike downhill for 5 hours, stay overnight at a local hotel, and the following day take an adventure ride on a local bus to Pokhara. 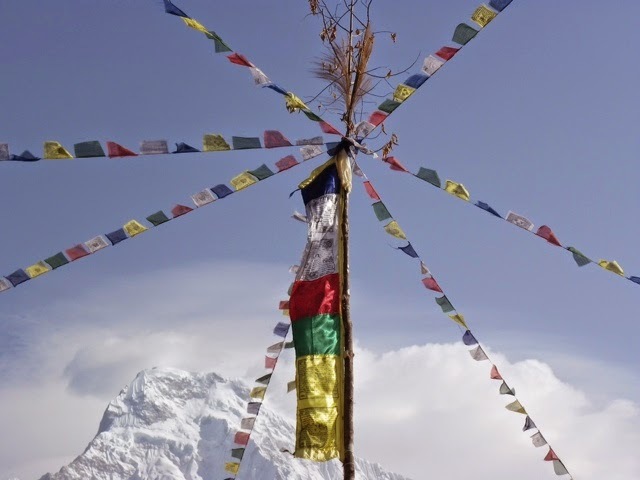 From here they often begin a 6 day trek into the stunning Annapurna region. Lyn says when she asks her clients what part of the trip they most liked, they all say “the village visit, as it was a unique experience into the culture of Nepali way of life, it is a place to be yourself in a world that is always trying to make you something else”. For Lyn, she feels she has become part of the community itself, her passion for exploring and learning about the country has led to several months spent in the village studying and living with the people. This has provided her with extensive knowledge of Nepalese culture, the people and their way of life which she is willing to share. This makes her an invaluable friend of the community. Woman Trekking. Trekking alone is not recommended. Even in the cities, walking out alone at night can be dangerous. Do not stay in bars and pubs till late night. Do not respond to anyone who make advances for introduction and friendship in bars. Follow the women-and-children rule. If you see women around, especially women with children, you’ve got less to worry about, this is critical at night. If all you see is men, men, men, high-heel it out of there. Don’t speak the language to creeps. If you’re dealing with an unsavoury guy who speaks English, don’t say hello back. Shake your head or shrug your shoulders and say “No English.” If he says “Speak Italian?” say “French, no.” If he says “Speak French?” say “German, yes.” However, do learn such key phrases in Nepali as it help if you happen to get lost in the language of the country you’re visiting. Never look at maps in public. Memorise them in advance, or look at them in a cafe or your hotel room. In many cities you can buy credit card-size street and transportation maps — which you can glance at inside your purse, so no one knows what you’re doing. Sometimes I sketch a rough map of major streets and write down the exact addresses and directions for places I’m going, to avoid the map problem altogether. You might also want to bring a compass to help you get your bearings when you’re lost, or just for navigating labyrinthine streets. Carry embassy contact info. If you’re going to a far-flung or potentially dangerous destination, always have with you a list of local embassies, with their phone numbers and dialling codes. Let the local embassy know you’re there, and leave a list of its numbers with friends or family at home. Check in with the folks at home. Tell friends when they can expect your calls and give them your embassy contacts in case you disappear. Also leave them phone numbers and addresses of hotels you may be staying at, along with a rough itinerary. Always carry I.D. Keep your passport with you at all times. You do not have to store it with the hotel owners, no matter what they say. Many places are required to take down foreigner’s passport numbers, but don’t actually need the passport. Make photocopies of your passport in advance, and hand over one of those. Don’t wear a money belt. Once you fish for your bills, everyone will know you’re a tourist. And once you’re pegged as a paranoid tourist, you’re a sitting duck. Don’t place you money in your back pack, as someone can grab your arms while his accomplice rips off your pack. Your best bet is to stash only a small amount of money that you may require for the days sightseeing, stuff money down you’re bra or in your shoes, and carry whatever you carry at home — just make sure it has a zipper. If you need to carry a handbag make sue you buy a “Pacsafe”.